After my dim sum late breakfast, I joined the blogger team and Hong Kong Tourism Board representatives to cross over to Hong Kong island. Our destination - Gough Street. It may not look like much. 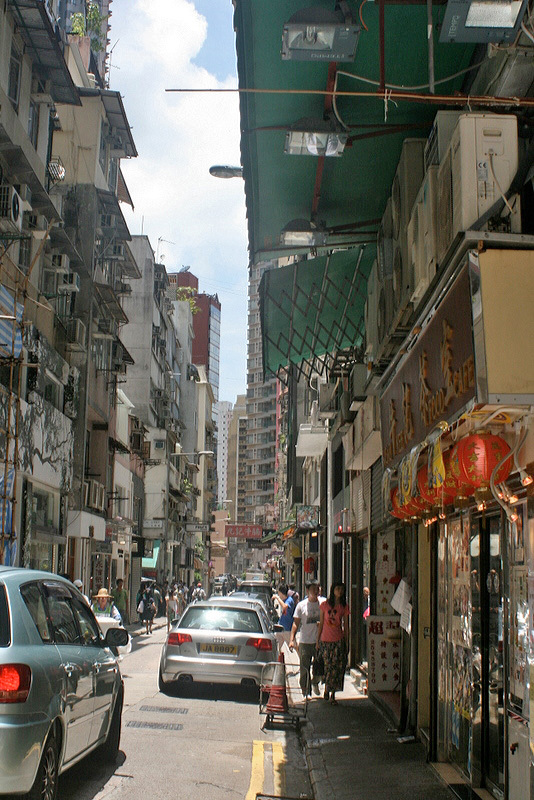 In fact, it resembles more a back alley than a proper street. But there are many wonderful shops and eateries here! 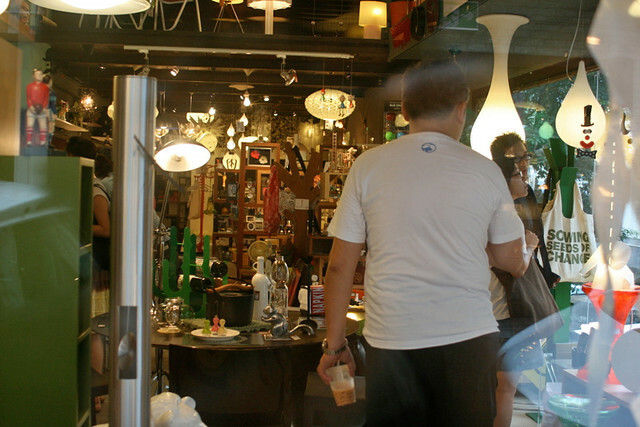 As we walked down the street, we saw many shops selling curios, hip designer home accessories, and upmarket bric-a-brac. 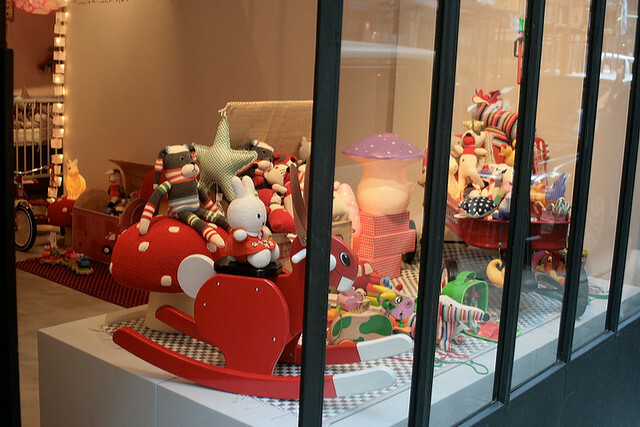 Also cute stuff for children and kids at heart. Many are European imports, so may not be cheap. But so nice to look at. Our lunch would take place at Gingko House at 44 Gough Street (tel: +852 2545 1200). It's a lovely little place run with plenty of heart. You see, Gingko House is run like a social enterprise - it gives the elderly meaningful employment, and taps on their rich life experience to enhance service levels, encourage slow food dining and build rapport with customers. 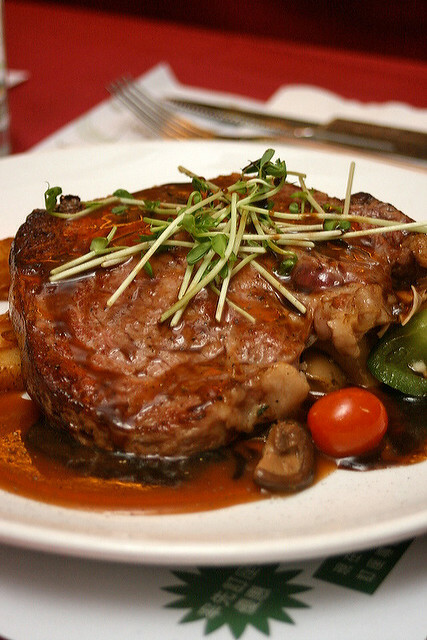 The fare is largely French and Italian dishes. There were two set lunches we could choose from - the three-course Lunch Menu (HK$50-108 depending on mains) that comes with tea or coffee; and the lighter/healthier two-course "Leisure Lunch" (HK$98+) which comes with an organic mint and honey drink. I chose the lighter one. The soup that came was an unusual mushrooms and walnut(!) broth. 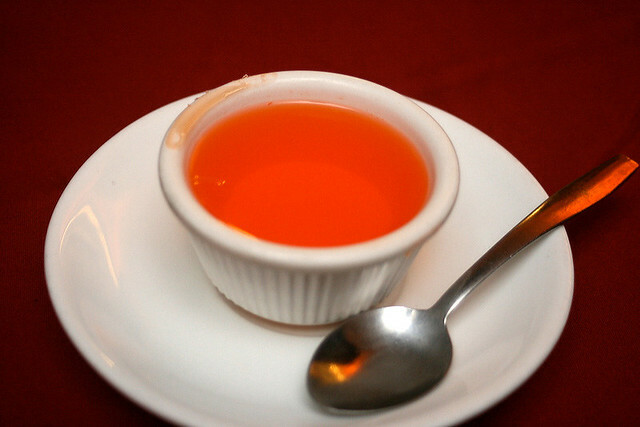 The regular menu gives you a cream-based soup. 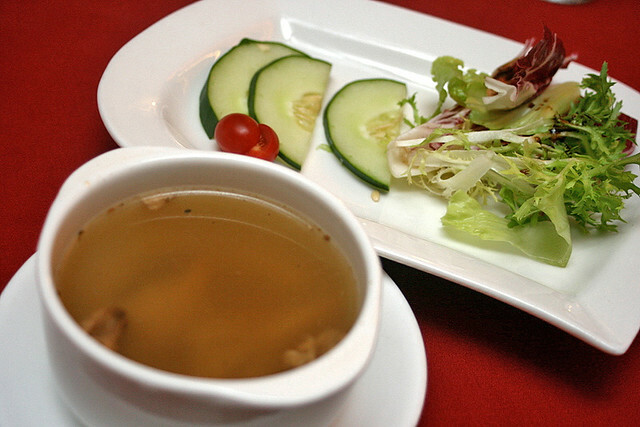 The salad consists of organic vegetables harvested from their own farm in Sheung Shui. Well, the reason I chose the lighter set was not for health reasons. 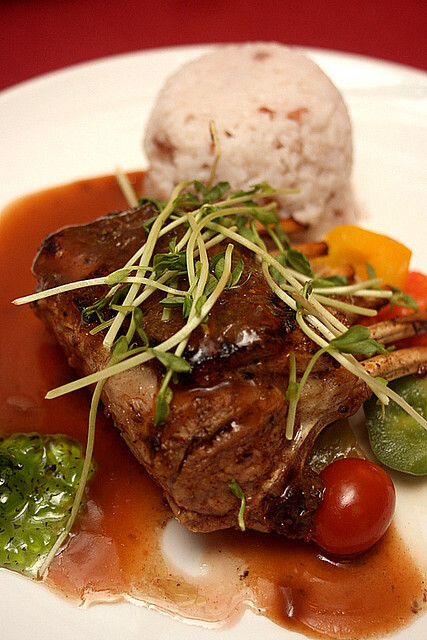 It's because it had the "Grilled baby lamb rib with homemade organic mint sauce" and I just could not resist this. 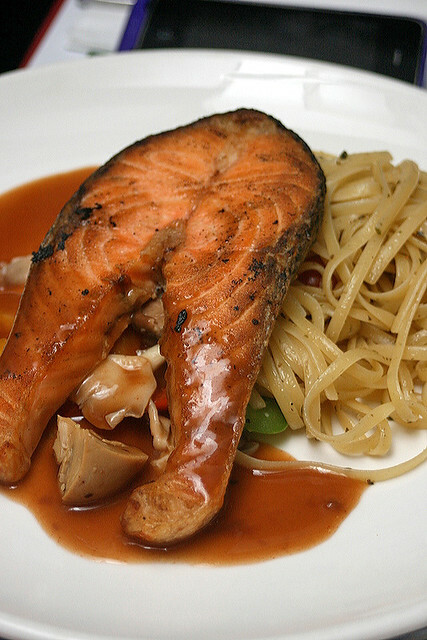 Others went for the maple mustard salmon steak with linguini in homemade pesto, also from the Leisure Lunch (no one went for the roast spring chicken option). Look at the huge servings! The rest who went with the regular set mostly chose the rib-eye roast with herb gravy. I was lucky to have a bite. It was tender and aromatic. Their chefs, although elderly, come with lots of experience from major hotels. They gave everyone the daily dessert (in this case, orange jelly) even though it's only on the regular lunch set. That was quite sweet of them. As we walked back to the chartered mini-coach, we saw again the ludicrously long queue for something that must be really good. We had no idea what. As I looked at that queue, I myself walked into another queue on my side of the street. Oh, what was this for? Oh perfect, just what I was looking for on Gough Street! 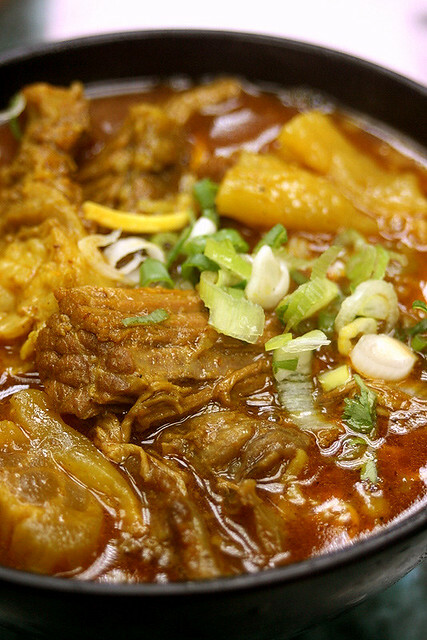 The famous Kau Kee beef brisket noodles 九記牛腩 (21 Gough Street, tel: +852 2850-5967). It counts even HK Chief Executive Donald Tsang, actors Tony Leung Chiu Wai, Nick Cheung and Takeshi Kaneshiro as its regulars. I waved goodbye to the other bloggers who were slightly incredulous that I was going to be eating again, right after lunch. Well, this afternoon was my last pocket of free time. I was determined to make the most of it. Luckily my queue was shorter, and it moved really fast. I was soon given a seat - right at the end of the shop, literally the last stool, sharing with a table of strangers who did not seem to mind. I had a view of the busy steaming kitchen - the action is non-stop and bowls just keep flying out. Service is also lighting fast. 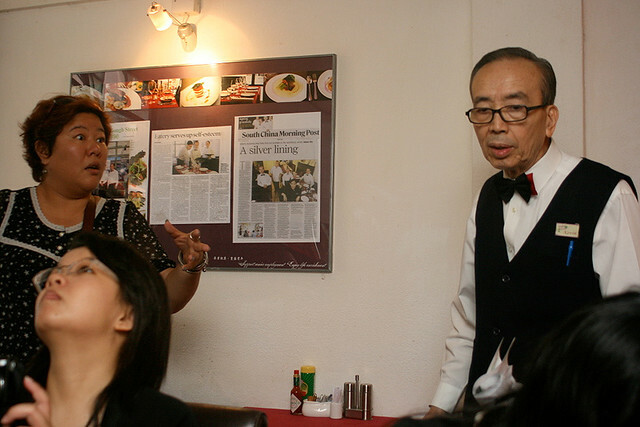 Two words into my halting Cantonese, and I was thrust an English menu. Thank God. There is a variety of noodles to go with basically beef broth or curry broth. I knew the beef brisket broth here would be fantastic, but I decided to be brave and go for the curry. I was well rewarded. The curry is not timid - it is rich, spicy and complex. The bowl was generously loaded with chunks of beef that had been diligently stewed for hours, until they were tearaway tender and tasty. My ee-fu noodles too, did well to soak up all the flavours. I was very satisfied. No matter what others say about standards dropping, this is still a very good meal, and for only HK$27. In an air-conditioned place. The other diners at my table kept saying how good their beef broth was. I wished I had the stomach capacity to try that as well. But I had more things on my list to eat. Mak's noodles was next. 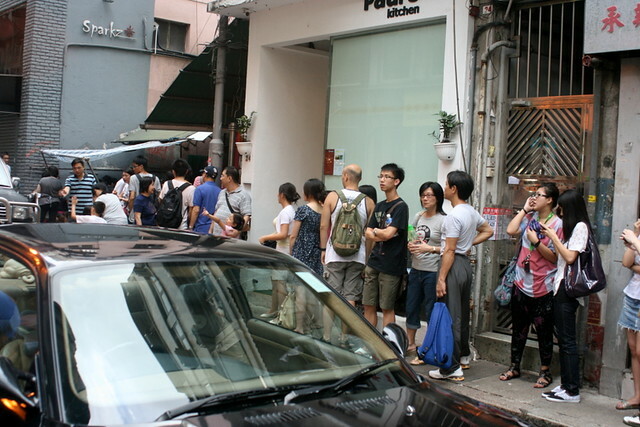 As I walked out of Kau Kee, I saw that the other long queue opposite it had not abated, even though it was well past lunch hour. What on earth were they serving at this makeshift food shack? I later learned from our Hong Kong guide that this was Sing Heung Yuen which serves tomato broth noodles with beef, and snacks like toast with condensed milk. Apparently, students and regulars will start thronging there from 6am. There is no closing time, just whenever they finish, usually in the afternoon. That's gotta be some kickass tomato broth to command a queue. Curious as I was, I had to move on quickly. Only a couple more hours left. I really loved how on this trip, a lot of road names became not just names, but real places to me. Gough Street was just the beginning. Wellington Street was next. P.S. This post is also on the SPH OMY "My Hong Kong Travel Blog 我的香港之旅" which aggregates the posts from the ten bloggers who went to Hong Kong. Head on over to see the unique perspectives and photos of the same trip. 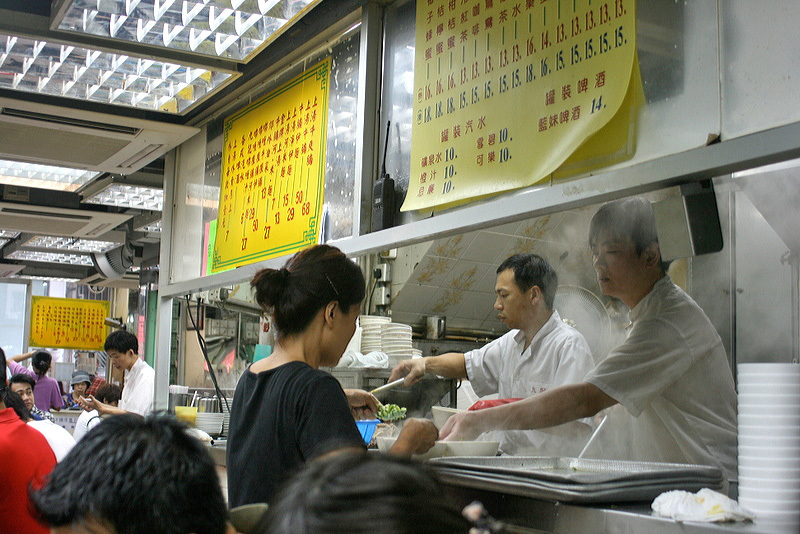 Oh, yes, the Kau Kee beef noodles is very famous. If you walk a little further down Gough Street, you will also see a little restaurant called Burger Republic - they serve one of the best burgers in HK - very juicy. The tomato soup noodles are good too...alot of treasures on that street, must try next time! "The curry is not timid - it is rich, spicy and complex." Shirley: I did see Burger Republic! In fact, it's almost opposite Gingko House, so I was looking at it while eating. Thanks for the tip! Janet: I guess I have to try it to know. I can't imagine queueing up for tomato broth! LFB: Kenny, fearsome maybe by Hong Kong standards! But still good! MissyG: Yes, even on a full stomach, it was good. P.Chong: Hmm, expectations too high? I saw your post - two things differed in our experiences: I had the curry version, and I went at off-peak hours. But it's true many people think they are getting commercialised and not as good as before. I still managed to enjoy my bowl though. Did you make it to Tai Cheong..? 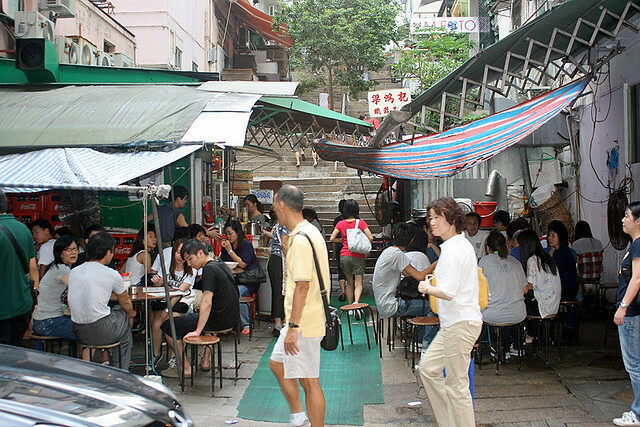 Its near that Central area.. Those egg tarts are just out of this world!!! I mean, how good can egg tarts be right.. I don't even eat them in Singapore.. But those babies were like whoo-boy-delicious-max! 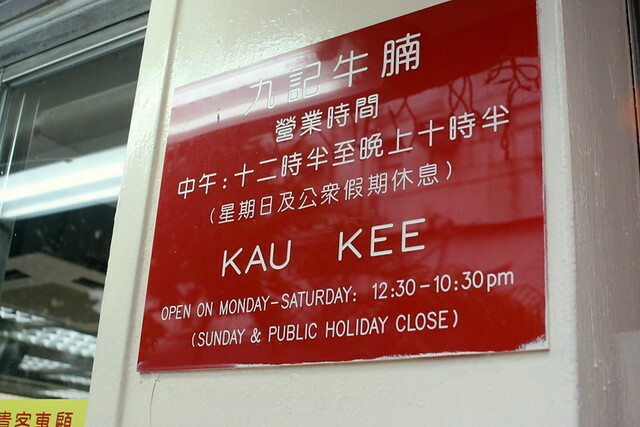 I had a really good meal at Kau Kee and was lucky to taste both the curry and the beef broth version. I like the broth version more. Also, Burger Republic is closed for good if I'm not wrong. Sigh. i just came back from HK and Sing Heung Yuen was part of my itinery! =) learnt from my local HK friend that the usual waiting time is about 30-45mins, i was lucky to wait about 15mins for a table. The beef tomato broth mee/ macaroni is a must-order food (since everyone is having that) and the interesting salty honey lemon sprite which will quench your thirst during the summer hot weather. Even their crispy toast with condensed milk and butter tasted awesome! My name is Amber Koh, and I’m the Marketing & PR Specialist at Hong Kong Tourism Board in Los Angeles. I’m writing to see if you could provide me the average number of people who visits your blog per month and the AD rates. I've noticed that you've been posting a lot about HK food, and I wanted to know how many people might have viewed the posting. As a PR specialist at HKTB, I like monitoring ANY stories related to Hong Kong and estimate AD values for each exposure. Too much food. Did you eat all of that? I am curious why are you fit if you eat so much food? Very nice and Creative blog! This is very interesting to read content like this . street teams Thanks for this.